Do you play the cards you’re dealt or reshuffle the deck, hoping for a better deal? 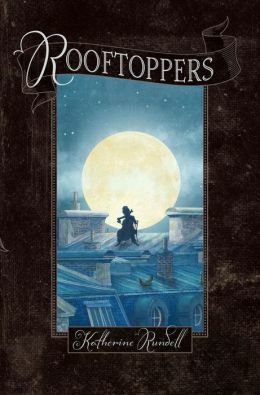 In Katherine Rundell’s Rooftoppers a little girl refuses to believe her mother has drowned; her faith, courage, and determination are rewarded as she searches for her mother along the rooftops of Paris. When a cruise ship sinks in the middle of the English Channel, Charles Maxim, passenger and scholar, rescues a red-haired baby afloat in a cello case. He names her Sophie and fights off the London social workers who would send her to an orphanage. On her twelfth birthday, after Charles is threatened with jail if he does not give Sophie to the authorities, Sophie discovers a plaque with a Parisian address inside the cello case. Convinced her mother is still alive, Sophie and Charles flee to Paris and the adventure begins. With the help of Matteo and a small band of clever homeless children with street smarts, Sophie roams the rooftops of Paris, listening for the sounds of her mother’s cello and challenging authority . The adventure and the ending are improbable, impractical and wonderful. Entertaining and clever – Rooftoppers can be enjoyed at any age. This entry was posted in authors, book review, books, children's books, children's literature, places to go, reading and tagged Cello, Charles, Children's literature, English Channel, faith, great phrases to use, Katherine Rundell, London, Ocean liner, orphans, Paris, Rooftoppers, Sophie. Bookmark the permalink.